The Queens Museum of Art is proud to present the first American exhibition of the work of Grimshaw. This world renowned firm, with offices in London, Melbourne, and, since 2001, in New York, has made its presence known throughout the world with projects such as the revolutionary Eden Project (Cornwall, UK), Fundacion Caixa Galicia (Galicia, Spain), Southern Cross Station (Melbourne, Australia) and a portfolio of powerful projects that exemplify the trademark design philosophy that you will discover in the galleries ahead. Closer to home, Grimshaw has emerged in New York City as a major contributor to core areas of the City’s infrastructure. Their vision for the Fulton Street Transit Center in Lower Manhattan will play a significant role in the redevelopment of that neighborhood. Their New Housing New York work combines green thinking and innovative, high quality design to create an affordable housing complex for the South Bronx. Grimshaw’s new line of street furniture – bus shelters, newsstands and automatic public toilets – brings utilitarianism and keen design together to make a minimal visual intervention on the bustling street-level environment, while making a major positive impact of the lives of those who exist within that environment. Not to diminish Grimshaw’s other significant projects, but it is clearly the work they have done on this very building that has impressed us most. 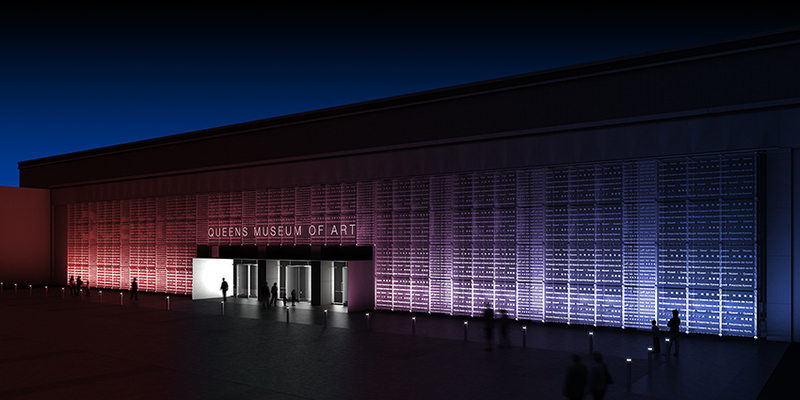 In 2004, Grimshaw with Amman and Whitney were selected as designers of the Queens Museum of Art’s expansion through the City’s Department of Design and Construction’s Design Excellence Program. Since day one of this partnership, the Museum has had the pleasure of working closely with Grimshaw’s New York office to realize our dream of expanding into the entirety of the New York City Building. By finding a perfect equilibrium of forward-thinking architectural sensibilities, realistic budgetary solutions, and a healthy give and take based on active listening, Grimshaw and the Museum have arrived at a gracious design that will transform our institution into a world-class forum for the visual arts, and culture at large. With the support of Queens Borough President Helen Marshall, the Department of Cultural Affairs, the Office of Mayor Michael R. Bloomberg, legislators on the City and State level, and members of the Museum’s Board of Trustees, Grimshaw’s design, and our goal of more than three decades, will be achieved. I would like to congratulate Sir Nicholas Grimshaw, and the teams in each of his three offices, on their vision, and invite each of you to enjoy Macro to Micro: Grimshaw in New York. Macro to Micro: Grimshaw in New York is made possible with support with Elise Jaffe + Jeffrey Brown, the New York State Council on the Arts, and the LEF Foundation. PLEASE NOTE: A portion of this exhibition will be off public view on Saturday, March 24 and Sunday, April 22. We apologize for this inconvenience. Also, the Fusion installation in the Large Triangle space will only be on view through May 27th.